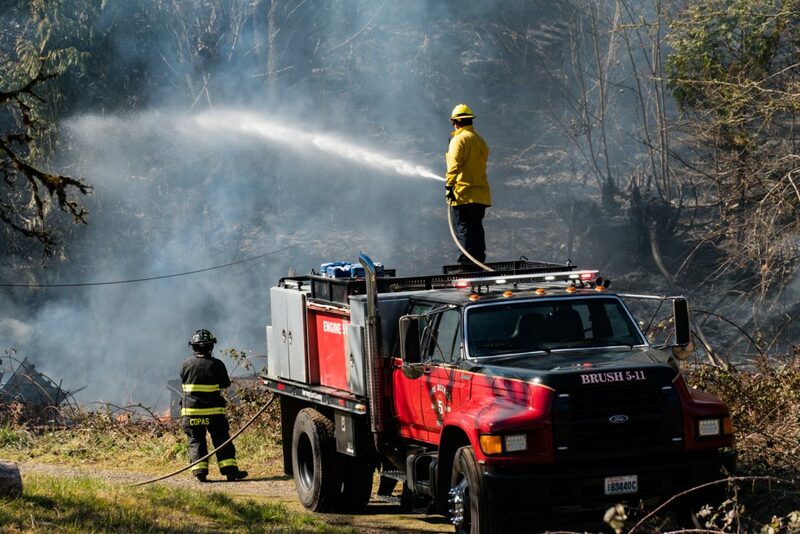 No injuries were reported from a brush fire that spread quickly in East Grays Harbor County yesterday. Grays Harbor Fire District 5 reports that the cause remains under investigation. 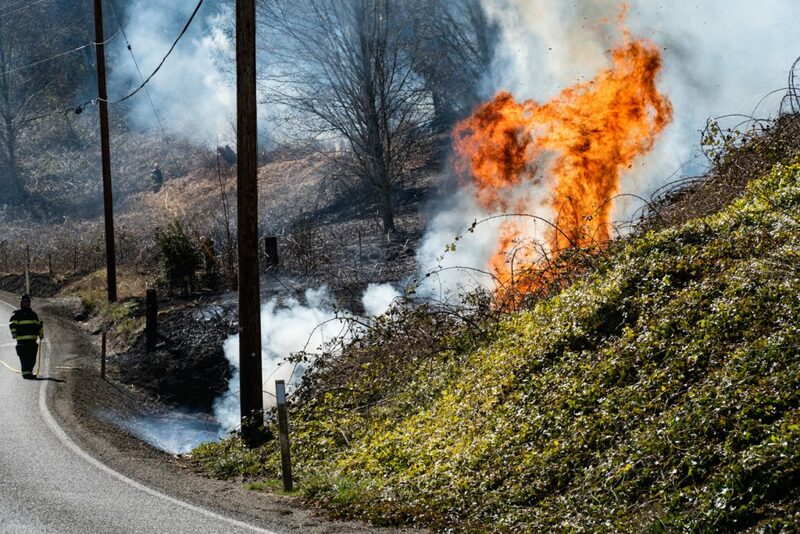 Crews were called to a grass fire that was threatening a home in the 200 block of the Mox Chehalis Road just before 2 PM Wednesday afternoon. The first crews on scene protected the home, but the fire spread through nearby brush and burned a total of about 30-40 acres. The original caller, a neighbor to the property, said that the fire was approximately 60×80 in size. The fire began on private property then worked its way towards DNR state lands on the North side of the Mox Chehalis Road. Multiple agencies including Elma, and McCleary fire departments and Grays Harbor Fire Districts 1, 2, 5, and 12 as well as agencies from Thurston county and the state Department of Natural Resources. A smoke column could be seen rising from the scene from as far away as Brady. On arrival the first unit advised that the fire was in heavy brush creeping up the hill with structures threatened. The fire was traveling in a North Northwest direction. 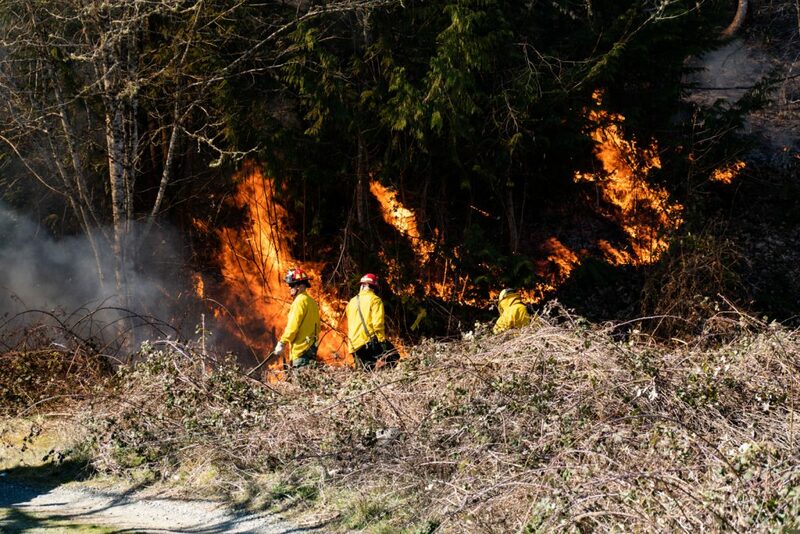 The fire was then estimated at 3 acres in size, with the Washington State Department of Natural resources being advised and mutual aid requested from McCleary Fire, Fire District 12, Fire District 1 and Elma Fire. Later Fire District 2 was added. The first arriving brush unit from the districts Malone Station arrived and started protecting the residence at the location and fighting the fire and was able to maintain that protection through out the firefighting efforts. The County Roads Department was called and requested to assist in closing the roadway for safety as the fire was along the roadway, and the numerous fire apparatus and crews working the scene were blocking the roadway. The roadway was later reopened just after 8:41 pm. Resources from the Washington State Department of Natural Resources arrived just before 4:00 pm with hand crew teams along with a helicopter for water drops and the Thurston County Wildland Strike Team . The helicopter along with a local command officer surveyed the scene to come up with a plan to continue to contain and knock down the fire which had grown to a size of approximately 30 – 40 acres.